In 1979 only two new models were released. Some of the previous models were shuffled around Europe and the USA, with different countries getting the new models in different years. 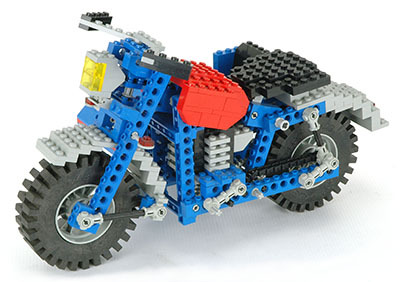 The motorcycle was also released under set number 8857 which was the first 4 digit Technic number, and was one of only two which would eventually be reused. 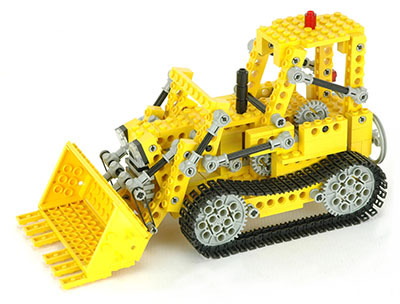 The bulldozer was the first (and nearly only) tracked vehicle released by LEGO. The fascinating series of four bar linkages and translating racks made for a complex mechanism, the likes of which has rarely been duplicated. It was made primarily of beams, axles, and connectors. The motorcycle was very large, and is one of the biggest to this day. It introduced the chain link and included a one cylinder engine and sidecar. It was made mostly of standard beams and plates, with only a few Technic elements. Neither of these models really broke new ground in the way of Technic functionality, but they were both examples of subjects which had not been made before. In only a few years this would almost entirely cease, and most new models would be newer and (sometimes) improved versions of subjects which had been tackled before. 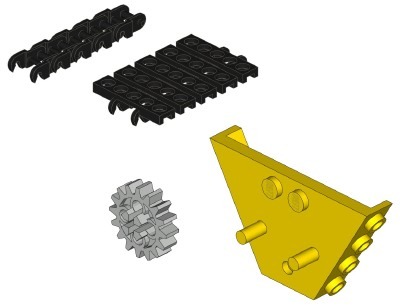 A few new parts were available this year including chain links, tracks, and the 16 tooth spur gear. The chain link is the one of the smallest, but most useful, Technic parts. This new link, which comes only in black, was designed with an opening the width of a spur gear, with a cross member which is the diameter of a gear tooth root, and with a pitch which is equal to the gear tooth pitch. In case it isn't obvious, they were designed to fit over the gears. Each link is a separate part and clips together. Because of this assembly method, there is no master link and one end of each link is an open section, unlike a real chain. This means that all the load is carried in bending instead of tension. You would think that this would make these parts prone to breaking, but they are actually quite durable. They have been used in various sets up to the present day. The track is a variation of the chain link. It has the same features underneath, but is 3 times wider to provide a large footprint. There have only ever been 3 tracked vehicles which used these parts, the bulldozer of 1979, and excavator, and a mobile crane. Various forklifts used a single track to attach to the lift mechanism. This part was replaced by a much larger track in 2007. A new 16 tooth gear was introduced. It shares the same tooth profile with the other spur gears, but the new number of teeth made a wider range of gear ratios available. This and the 8 tooth gear have probably been the most common gears throughout the history of Technic. This isn't technically a Technic part, but had not been seen before in Technic sets, and was only seen one more time in a Technic set. It was unusual at this time for LEGO® to produce such a specialized part, since most parts still had a wide range of possible functions.